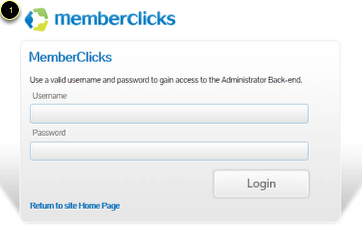 Your ASA or Authorized Service Administrator profile provides access to MemberClicks as an authorized account contact. It will be used to access the Help Center, manage the product and maintain your MemberClicks contact information. Our Help team will also use established ASA profiles to determine eligibility for phone support and respond to submitted Help Center requests for product support. Your ASA profile contains your MemberClicks service contact information as well as the necessary product attributes (username, password, contact name, email address) to allow you to perform any product related task like maintaining your website, managing and communicating with your membership or creating forms. You'll also be able to tell us which MemberClicks service related communications you'd like to receive by selecting them in your ASA profile. We'll then communicate accordingly based on your selections to the email address entered. PIN: Your ASA profile contains a personal identification number that is used for security purposes. When you call the Help Team, they will ask for your PIN to be sure that you are the profile holder. You may set your PIN to any 4 digit number that you'll easily remember. You may add as many new ASA profiles as you'd like. Please note that if you currently have 2 or more ASA profiles, you will need to agree to a $15/month charge for each additional profile you add. You can always see the number of ASA profiles you have on the Admin Home page - either in the "admin home statistics" area next to "ASA Profiles" or in the "package limits" area. Complete the profile (at least the items in red) and then click "save" at the bottom. Once saved, the profile is active immediately and the new user can login to update information if necessary. If you need to remove an ASA profile or change the contact, you will need to contact our Help Team. ASA profiles cannot be deleted within your administrative area. The Help Team will be able to assist in removing the necessary account so you are able to add a new one. Only ASA profile holders are eligible to receive MemberClicks support. The ASA profile is a separate profile in its own group; it is not part of the current Admin group. Once you have obtained your login credentials for your ASA profile it may not be necessary to maintain your Admin profile or perhaps even the Admin group as the ASA profile will allow for performance of all necessary product Admin tasks. The ASA profile is a MemberClicks super user profile for managing your product as well as your services and account. The ASA profile will have all attribute, system and page permissions automatically assigned for any modules available with your services. The permissions of the ASA profile can not be restricted and can not be managed as they would be for a product defined group. The ASA profile(s) are not exportable and are unaffected by data imports or form testing. Help requests can be opened by the ASA profile holder using the Help Center message center. The message center allows an ASA profile holder to open and track support requests and receive responses to open requests by logging in to MemberClicks and navigating to the Help Center. No more worries about lost email or duplicate requests now that the message center will be used to communicate with MemberClicks and view your issues. Each MemberClicks account is allotted up to 2 ASA profiles at no charge. You may add as many ASAs as you'd like, however there is a $15/month charge for each after the initial 2. The Help Center is the main hub for any support needs or questions that you may have. You are able to browse our knowledge base for overview and how-to articles (such as this one), ask general questions in the community area, submit product enhancement ideas, as well as submit support tickets directly to our Help Team. To access the Help Center, click the "help center" button in the blue admin bar while you are logged in with your ASA profile. Once in the Help Center, use the navigation buttons to access resources and forums (knowledge base articles), submit a request (send a message to our Help Team), and check your existing requests (view responses to your requests). ASA profiles can only be viewed by clicking the "ASA Profiles" hyperlink from the "statistics" section of your Admin Home page. The hyperlink is only visible by other ASAs or custom groups that have the "admin user" checkbox checked under Group Management in the "group properties" section. ASA profiles do not return, and can not be returned, as part of a result for any other product initiated search. ASA profiles are editable only by the profile holder, not another ASA. The information displayed on the profile card or the holder's editable view is not configurable. The card view of the profile (only accessible to other ASAs or groups designated as "admin group") will show your name, title, contact email address, and phone number(s). ASA profiles can not be deleted. In the event that you need to remove a profile for an existing ASA and replace it with another you must contact the Help Team to retire the profile. Should you wish to add additional ASA profiles beyond your current allocation you may do so as an ASA by clicking "add" next to the "ASA Profiles" hyperlink on your Admin Home page.